I was speaking with a prospect the other day and the subject of recruiting women in sales came up. This company is extremely impressive: high-growth, exciting market, great location, amazing sales culture - the works. 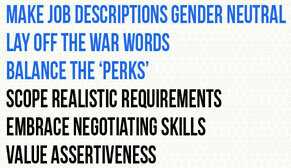 However, they hadn’t made much progress in balancing the gender of their sales force. In fact, their current ratio was roughly 7:1 (male to female). This blew me away as this company had so much going for them. If they were struggling to find women for their sales organization, what does that mean for our industry? So I did some research and came up with a few ideas. Again, from Lean In, ‘There is little downside when men negotiate for themselves. People expect men to advocate on their own behalf, point out their contributions, and be recognized and rewarded for them. For men, there is truly no harm in asking. But since women are expected to be concerned with others, when they advocate for themselves or point to their own value, both men and women react unfavorably.’ Note that last sentence. Interesting, no? Similarly, assertiveness has been found to help men and hurt women. So if an interviewer finds a female candidate ‘overconfident’ or ‘too aggressive,’ ask them to reflect 'If this candidate were a man, would I feel the same way?’ At Dreamforce, Marc Benioff shared a story around this very issue (link jumps you to the relevant moment). To road test these theories, I interviewed a Sales Manager at Yesware, a Boston-based high-growth SaaS company. Zoe Silverman runs Sales Operations and has been responsible for hiring the current Inside Sales team of 6 (4 of which are women). We saw so many companies falling into the trap of only hiring men. It is an easy cycle to fall into and since we had the luxury of starting from scratch we got to make a conscious decision to build a diverse sales culture. We did not create a single hiring profile based on college major or personal interests, but rather went for commonalities like ‘dedication to success,’ ‘passion for a consultative selling approach,’ ‘desire to work for a startup,’ etc. I think part of our success in hiring women was that their first interaction was with me so they knew Yesware had women playing a significant role in building the sales team. Having said that, I did have few awkward experiences when interviewing men who were dismissive and short and spent most of their time trying to get to the next person. They obviously did not make the cut. Has the gender balance of your sales team ever come up? Are you succeeding or struggling to recruit women? I'd love to hear if (and how) your organization is addressing this challenge. And hey… if you are a woman in sales, share what attracts you to a company and help the entire community! Thanks in advance.